Since 1971, Sausalito Precious Metals, Inc., located on the waterfront in Sausalito, CA, has been home to the Peter James Studio. Their designer, Lyn, is a California native who knew at age 14 that her life's passion was jewelry design. Anxious to exploit her new and innovative techniques, Lyn began working at Peter James in 1974. Each piece of jewelry is individually handcrafted and no two items are exactly alike. By hand forging and texturing the object with cross peen, ball peen, and anticlastic methods, wire and sheet metals are transformed into wearable works of art. 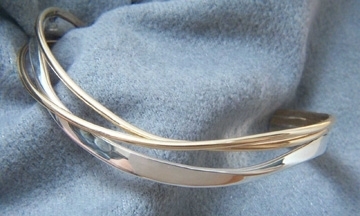 Once more highly regarded than gold, sterling silver is an essential component in today’s contemporary jewelry designs. 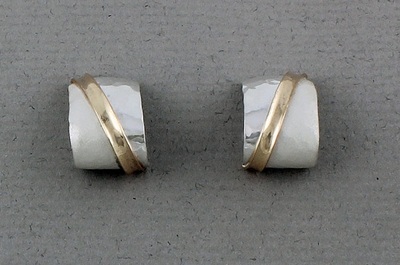 Lyn’s style is to combine sterling silver with 14k gold or gold filled to create classic jewelry pieces. Her designs are inspired by the natural beauty of the waterfront, combining lines and forms that evoke an organic and casual elegance with dramatic flair. The contemporary, timeless designs created at the Peter James Studio are featured exclusively in prominent craft stores, fine galleries and jewelry stores throughout the United States. Every piece of Peter James jewelry is handcrafted at their studio in Sausalito California. 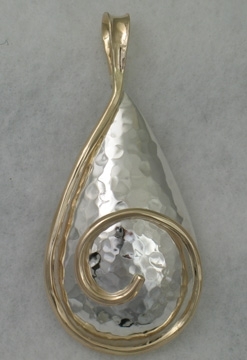 The 14k, sterling silver and gold-filled jewelry designs by Peter James of Sausalito Precious Metals have been part of By the Bay Gallery’s collection of Fine American Crafts since 1994.